OEM factory motor for the two speed model E2 Type 12 Rainbow vacuum. Comes complete and ready to install. This motor (pump) has had many revisions and this is the most current revision available to date. Some pumps have "Part No." R11409 and also "vacuum pump subassembly" listed on the side of the housing. 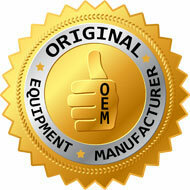 This is an internal item number and the R12612 is the correct number for the same item. The clamped upper bearing kit is available to upgrade your motor to the most current design on the E2 Type 12 Rainbow main units. Upgrade for both the "Original" motor in the Gold version and also the "Direct-Support" motor design that was in both the Gold and early Silver version. The "Original" motor design was effective serial number 1000000 with a start date of September 4th 2003 through serial number 1167459 and an end date of October 24th 2005. The "Direct-Support" motor design was effective serial number 1167460 with a start date of October 25th 2005 through serial number 1450975 (rough estimate) and an end date of May 2009 (estimate). If you have had an issue with the top bearing wearing out the "Rotor" (Armature), then you need to purchase this upgrade kit to prevent the issue in the future. Easiest was to determine if you have the most current version is to look for the H610 "Upper Bearing Nut" that would be on the very top of the motor on the most current design. Stator assembly for the two speed E2 Type 12 (e2 Black, Silver, Gold) Rainbow vacuum. This part works directly with the rotor assembly to create the performance you enjoy from your cleaning system. Standard field screw for all E2 Type 12 model Rainbows. This screw should never need replaced. If it does due to rust or corrosion, then please read the owner's manual on how to care for your machine or call our technical support department. Screeching sounds from the motor may signify a needed replacement of this part. Factory OEM bearing for the two speed E2 Type 12 (Black, Silver, and e2 Gold) Rainbow vacuum. Bearings get the most wear and is an inexpensive replacement while you are servicing your motor. If you have any squeals during the start up or slowing down of your unit, then this could be the issue. Spring washer that sits on top of the rotor assembly on the original pump design in the E2 Type 12 version Rainbow. Base bearing sub assembly for the two speed E2 Type 12 (e2 Black, Silver, Gold) Rainbow vacuum motor. Comes with the bearing installed and works on all versions of the "Hurricane" motor. 12mm ball bearing that fits the two speed E2 Type 12 (Black, Silver, e2 Gold) Rainbow vacuum. Bearings receive the most wear and should almost always be replaced if you are servicing your machine. Encoder assembly for the two speed E2 Type 12 (e2 Black, Silver, Gold) Rainbow vacuum. The encoder is what switches the polarity for the "Hurricane" type motor that is installed in all E2 Type 12 models. This is the standard encoder screw for all the model e2 Rainbows. This standard motor housing screw is used on all model E2 Type 12 Rainbows. This screw has always been black and is used on the main housing for the cap cover assembly and the rear cover assembly on the early version E-2 Rainbow. Stage assembly for the two speed E2 Type 12 (e2 Black, Silver, Gold) Rainbow vacuum. This part should never need replaced and if it does, then you might want to refresh yourself with the owner's manual to make sure you are storing and caring for your system. Upper fan spacer for the two speed E2 Type 12 (e2 Black, Silver, Gold) Rainbow vacuum. Another items that should never need replaced unless you are not taking care of your unit properly. Lower fan spacer for the two speed E2 Type 12 (e2 Black, Silver, Gold) Rainbow vacuum. If you notice rust or corrosion on this part, then please make sure that you are not storing you Rainbow over top of the water pan when not in use. You should not see any issues with this part if you are taking good care of you unit. Impeller / motor fan for the two speed E2 Type 12 (Black, Silver, e2 Gold) Rainbow vacuum motor. This part should never need replaced. If it does, please refresh yourself with the owner's manual on the proper care and storage of your system. Lower vacuum pump housing for the two speed E2 Type 12 (e2 Black, Silver, Gold) Rainbow vacuum. Inexpensive replacement if you break or damage during service. Standard stage nut for all E2 Type 12 model Rainbows. This nut is prone to rust and should be replaced for ease of service in the future. Anti static strip and tab that came standard on the model E2 Type 12 (e2 Gold) version one Rainbow. This part has been upgraded with the clamped upper bearing kit. Original OEM factory separator for the two speed E2 Type 12 (Black, Silver, e2 Gold) Rainbow vacuum. This part is very important to the working of the system. It separates the air from the water. It throws the water back into the water pan and allows the air to go up through the motor and out the exhaust. Improved OEM separator nut for all E2 Type 12 and E2 Type 23 two speed Rainbow systems. Now includes an alloy metal threaded insert for an improved overall design. If your separator nut is/was brass and you have an E-2 (e SERIES™), then you need to order the R7491 separator nut. This main gasket on all E2 Type 12 two-speed units seals the water pan to the main unit. Check this item for wear if you notice a loss of performance. 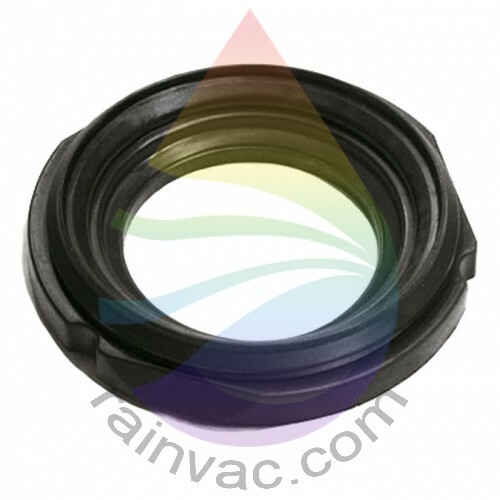 Rainbow vacuum pump bottom seal for the two speed E2 Type 12 Rainbow vacuum. This gasket is very important to prevent air from leaking and reducing performance. Place a small amount of dish soap around edge to help mount this down into main housing.